Wondering how you're going to keep the kids off the iPads and iPods over Spring Break? Out of sight, out of mind: keep them busy with something else. That something has to be interesting, has to engaging – and it has to be fun. If you're not going skiing or to Science World every day, you might want to think about stocking up on a few activity kits and arts and crafts. Getting creative is great for exercising imagination, fine motor skill development and building confidence through a sense of accomplishment. Here are our top three ways to get creative with your kids for Spring Break 2013. 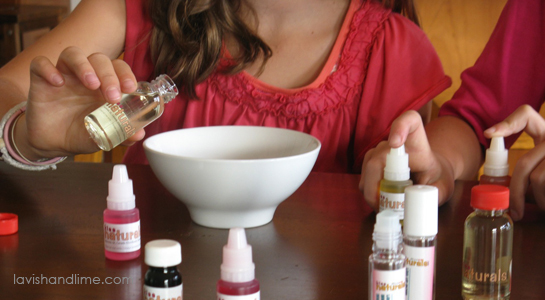 Making homemade bath & beauty products will help keep kids busy over Spring Break. 1. Make homemade bath and beauty products. Not only will know exactly what ingredients are in the products being used by your child, but you and they will have fun making them! One easy option is this Natural Soap Making Kit for Kids which makes 16 heart-shaped soaps with citrus scents. The same company makes a Bath Fizzies Craft Kit, a Homemade Lava Lip Gloss Kit and a Make Your Own Lip Balm Kit. All contain only safe, natural ingredients and include step-by-step instructions, plus they're made in Canada. If you're feeling adventurous, pick up the individual ingredients and make your own soap with these homemade soap recipes or try one of these homemade bubble bath recipes. A teen may be interested in making this Honey-Avocado Hair Revitalizing Treatment or some easy Sea Salt Body Scrub to put in jars, decorate and give as gifts. 2. Discover new painting techniques. Start out with some interesting paint to get the kids hooked, like Glob Paint Powder made from natural fruits and vegetables and the sky's the limit! Try stamping with cut vegetables and make interesting things like celery roses or these cute potato prints. If there's snow around, take the paint outside for some invigorating snow painting. Alternatively, try hammering leaves into paper for a totally different 'painting' technique. 3. Colour easter eggs. Start colouring eggs during Spring Break and you'll be ready for Easter right on time! If you're at all concerned about ingesting chemicals with your eggs or worried about the kids wearing more dye than they dip, try this natural egg colouring kit for kids. It's made with only natural and organic plant, fruit and vegetable extracts from annatto see, curcumin, purple sweet potato and red cabbage. Another option is to collect colourful tissue paper and wrap it around eggs, wet with water and remove paper for colourful imprinted patterns.